I asked my CPA to write a brief summary regarding internal controls because it is such an important security factor. Richard D. Leipzig CPA wrote this for me. If you'd like to follow up with him, you can reach him at 503 230 0231. The current rage is Cyber Security to protect your computers. However, how do you protect your business from theft of the company's assets, specifically cash? Who among us has not either had or heard of: "The bookkeeper stole money from the business." All businesses large and small need to have Internal Control over their financial records. 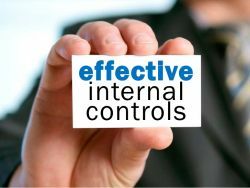 The technical definition of internal controls can be stated: An internal control is a procedure or policy put in place by management to safeguard assets, promote accountability, increase efficiency, and stop fraudulent behavior. Simply stated, An internal control is a process to prevent employees from stealing assets or committing fraud. Since the accounting scandals in the early 2000s, there has been an increasing importance placed on internal controls at every level of an organization. In fact, the Sarbanes Oxley Act requires management of public companies to design, implement, and personally evaluate the effectiveness of internal controls within the business. Executives found guilty of not properly managing the internal control structure of their companies can face fines and even prison time now. Needless to say, internal controls are a big deal. They protect the company assets and even help streamline the operations. Generally, internal control has 7 elements. Separation of Duties: One person checks another. Access Controls: Who has access to what. Reconciliations: Do your books show exactly what the actual accounts show? You can get more information on each of these 7 elements here. For us small businesses with 2 - 10 people, the resources are not available to implement full blown internal control procedures similar to large businesses. So what are some simple procedures that should be implemented? Separation of duties is probably the most important item. More than one person needs to monitor the cash disbursed and received. The person writing checks (paying bills) should not be the signer of the check (or have authority to pay money from the bank account). The person receiving funds should provide recaps and proof of bank deposits to a superior. The bank account should be reconciled promptly and the reconciliation reviewed by a superior. Every small business is different and the internal controls may not be "by the book." See the ideas at this link to consider for internal control procedures and/or check with your CPA/tax adviser or other financial consultant.